The vitality of the pastoral phenomenon of Opus Dei required provisional solutions to bridge the canonical gap. St. Josemaria Escriva covered the gap through several delicate, very well-studied, canonical steps in order to be able to enjoy the least inconvenient canonical framework at each historical moment of the growing institution. 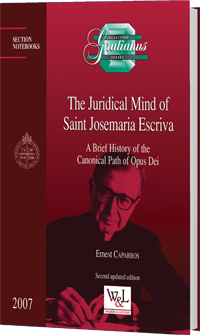 The aim of this book is to make a brief historical presentation of the canonical path taken by Saint Josemaria to lead the institution to its final juridical configuration: the personal Prelature established by Pope John Paul II in 1982.